Our curriculum is like a set of keys that unlock the temple gates of wisdom. By systematically cultivating attention through the eight limbs of yoga, our graduates increase their capacity for non-judgmental awareness. This concentrated power allows them to take actions that fulfill their core intentions, while honoring the living system of the earth. Humans evolved as members of small tribes, and research has shown that people learn and function best when they are members of a small group of people working toward a common goal. Exploring healthy group dynamics and human relationships is a core element of our yoga training curriculum. The best learning environment is one where each person’s questions and concerns are addressed in a way that empowers the community as a whole. For this reason (and because small groups lessen our impact on the delicate local ecosystem of Pavones) we limit our group sizes. Our 200-hour yoga teacher trainings are limited to less than 20 students. The advanced trainings (unless otherwise indicated) are limited to groups of 12 or less. In both cases, every student has ample opportunity to authentically connect with both students and teachers, and to have his or her individual questions answered. It also allows us, as a group unit, to take full advantage of the evolutionary benefit of being a part of a small community. By limiting group sizes, we have time to develop authentic student-teacher and student-student relationships that will last a lifetime. Our graduates become part of a tribe; upon leaving Pavones, this tribe continues to exists and function as a support system. We have set up Pavones Yoga Center at this remote, pristine end-of-the-road location with deep intentionality. There are few places left in the world where one really can retreat. Pavones Yoga Center is one of those places. Every aspect of our yoga teacher training experience has been designed to facilitate a re-membering of self as a part of the living whole (our planet). We know (and practice gratitude meditations toward) the farmers who bring us their fresh, organic produce. We can walk to the natural spring that provides us our drinking water. We schedule regular play times to make sure we get down to the ocean to dunk our heads underwater, to listen to the whales sing (an experience that just will not happen in a pool). And because our yoga teachers in training live and breathe and play and practice together in this wild eco-zen-yoga microcosm for a month, we are shaped by it, and by each other, in ways we could never predict in advance. By being immersed in this unique environment, you’ll learn to intuit the language of river song after rain, to feel how you are shaped by the energetic quality of each day, and to listen to the sounds of the jungle. Nature is a revered member of the Pavones Yoga Center community and our relationship to nature (and Nature/Self) is one of the ways we will explore the philosophy and ethics of yoga. Never, in all of human history, have we been exposed to the kind of information-overload that’s accessible at the touch of a screen today. 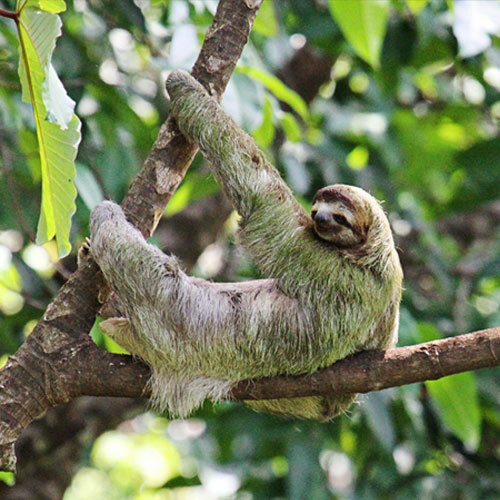 By committing to a basic level of digital detox, and through our unique, nature-based yoga inquiries, you will have the opportunity to investigate, at the slower earth-pace, your place in the natural system of things. Throughout your time at Pavones Yoga Center, we’ll offer different ways for you to explore a fundamental question from the yoga tradition: who am I? This question is at the root of all contemplative traditions. It’s hard to dig deep into this inquiry question while receiving a steady stream of input from the digital world. Even the ancient yogis left their villages to head for the hills and forrest hermitages when they were ready for deep contemplation. As part of the PYC yoga teacher training program, we’ll review research that is currently underway about the effects of screen-time on the brain, on human emotions, on our relationships, and even on our way of perceiving the world. You’ll learn how computers and the “self” that we create through online social networking is changing the very way we perceive the self. At the end of your digital detox, you’ll return to the online world with a wider perspective. You’ll be able to use technology mindfully, in a way that is consciously balanced, you’ll know how to watch for tell-tale signs that you need some offline time. Your pratyahara practice will help you transition from our retreat environment back into the modern world with a new skill set to maintain a healthy interplay between the online self and the offline self. Because we understand that some people may need to occasionally check in with their loved ones, there is limited internet access at scheduled times and in specific locations. 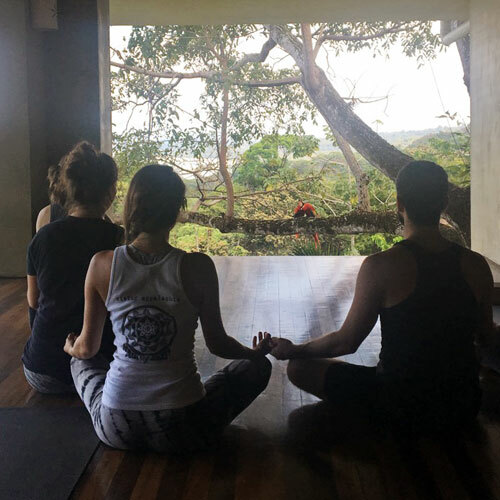 Other than that, your time at PYC will be shaped by real conversations at meal times, and your understanding of yoga will come partly from a direct exploration of the non-pixelated natural world. Sign up for news, event updates, special offers & more! © 2018 Pavones Yoga Center. All Rights Reserved.